This recipe is simply spectacular and oh-so flavorful! I found it on the Eat Clean Diet website today and I made it for dinner tonight. Dishes like this remind me of Indian food with the sweet spices of cumin, coriander and curry. What I found interesting (and fabulously delicious) was that the spiced veggies were served over bulgur wheat. Guess I never really realized how delicious and nutritious bulgur wheat is. It’s supposed to have more nutrients that regular white rice, which is pretty delicious itself, but sometimes I find it hard to merit all those carbs and so little flavor. The bulgur wheat has a flavor similar to brown rice, but a bit richer. It sort of looks like brown rice, but it has shorter grains. It also cooks super fast and 1/2 cup dry goes a long way! This entire recipe is a bit time consuming – at least it was for me. Cutting the cauliflower took the most time. It’s not quite as easy to cut as broccoli and about 10 times as messy! I normally hate cauliflower, but this dish made me rethink my feelings towards the crunchy white veggie. I used the pre-cubed tofu because it seems to hold up better in stir fry dishes rather than the block and cutting it up (even the super firm kind). Also, instead of a yellow onion I used the mild, sweet Vidalia variety. But what makes this recipe especially delicious to me is the addition of cilantro. I’m pretty obsessed with it! In a small saucepan, bring 1 cup / 240 ml water and salt to boil and stir in bulgur wheat. Cover and reduce heat to simmer for 15 minutes or until all water is absorbed. Remove from heat, fluff, cover and set aside. Heat oil in a large skillet over medium-high heat. Add onion and garlic and cook until starting to brown, about three minutes. 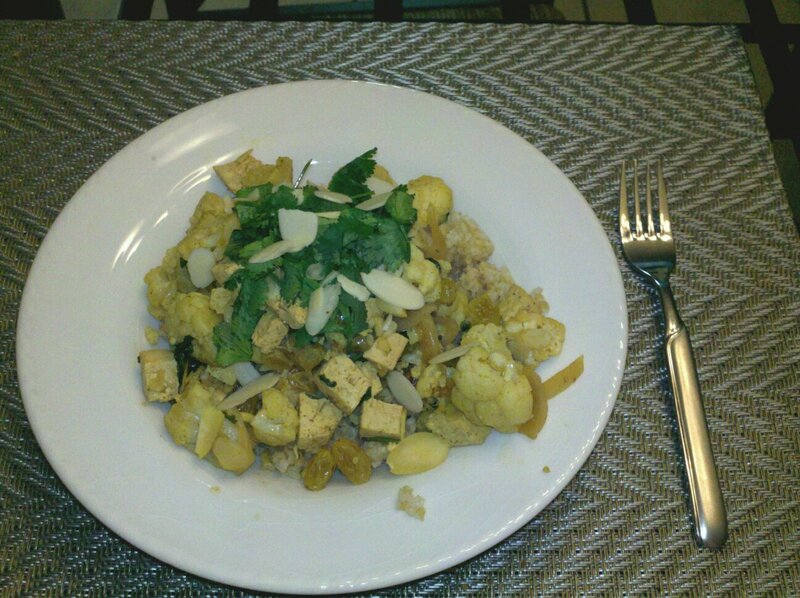 Stir in cauliflower, tofu, raisins, spices, salt, pepper, vegetable broth and bay leaf. Bring to a boil, cover and reduce heat to simmer until cauliflower is starting to become tender, about three minutes. Uncover and continue to cook until broth reduces by half, about five minutes. Remove from heat and remove bay leaf. Stir in almonds, reserving a few. To serve, top with yogurt, remaining almonds and cilantro.